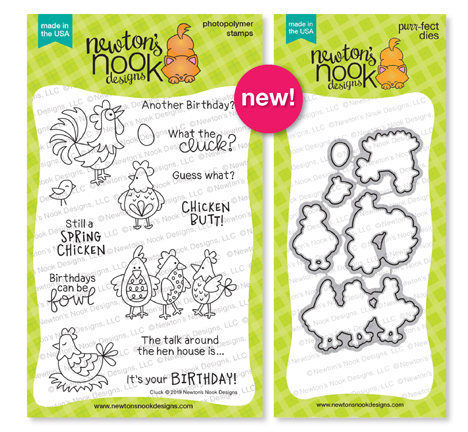 Hollybeary Creations : Newton's Nook Designs April Release day 2! Newton's Nook Designs April Release day 2! This set is perfect for all those chicken lovers out there and it will pair nicely with Oink which we introduced yesterday. For my card today I used the Wood Grain Stencil with some Distress Oxide inks on a piece of watercolor paper and then I trimmed it to leave an edge where the card base would show. I adhered the background with some Fun Foam after stamping the sentiment in the lower corner. Then I stamped and colored the images with Copics and used the coordinating dies to trim them out. I adhered them with Foam tape and added a few highlights with a White gel pen. Then I added some Enamel Dots that coordinated with the Green in the chickens. This is such a cute set with Fun images. Such a cute card. I really like the colors that you used on the Chickens. I like the wood background--just like a chicken coop. Really cute. Love the rich colors you chose to color your chickens with! Love the wood grain in the background. Loving the way you stenciled the background with the new stencil. Cute card with traditional "farm" colors. Love it! 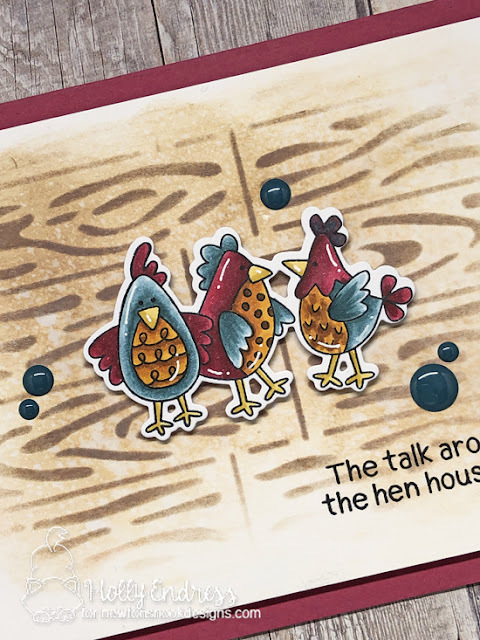 Cute chickens and I like the wood grain background. Fabulous card Holly, especially love the stenciled background. Love the very pretty (& different!) colors you used for the rooster. I love this stenciled background! Great coloring too! Love the colors of the chickens! Love the colors on this fun card! Adorable chickens and great background stencil design! Oh this is just wonderfully colored and designed! Your darker color scheme looks amazing! Perfect background for those cute chicks!! 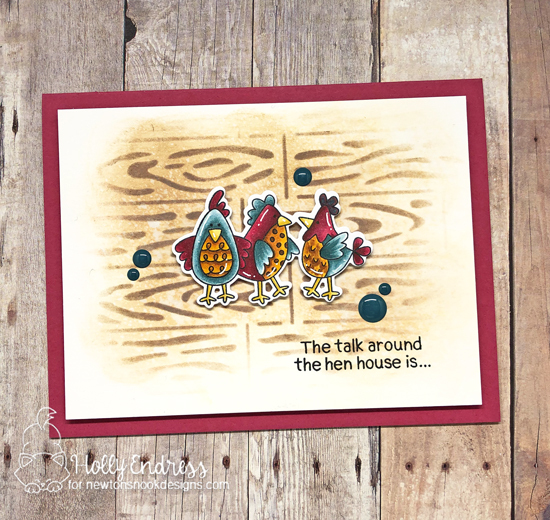 I just love the stenciled background for these fun chickens. Great coloring on the multi-color chickens. Great design! Really like the wood grain stencil in the background. Love the chicks! These chickens are too fun! Great card.